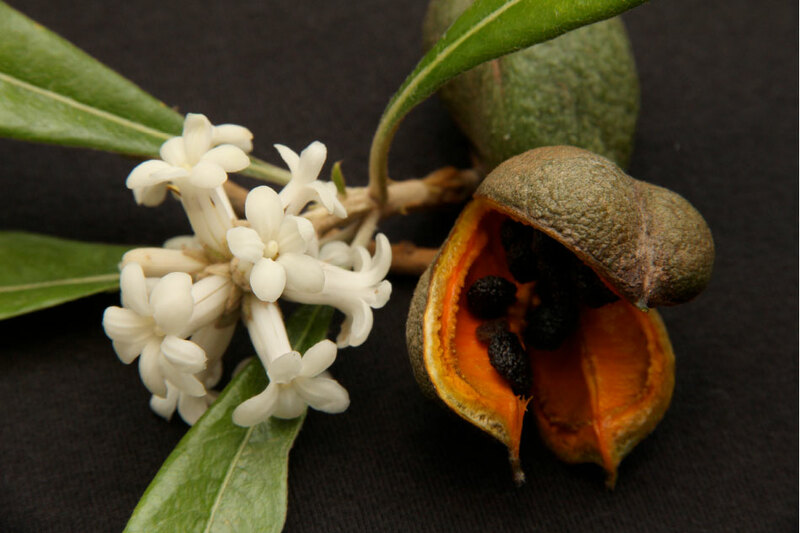 Hoawa in Hawaiian, Pittosporum hosmeri, is part of a family that has about 150 species of Pittosporum throughout Africa, Asia, Australia, New Zealand, and on a number of Pacific Islands, including the Hawaiian Islands with eleven endemic species. The generic name Pittosporum is derived from the Greek pittos, pitch, and sporos, seed, in reference to the film of viscid resin covering the black seeds. The specific epithet hosmeri is named in honor of Ralph Sheldon Hosmer (1874-1963), Hawaiʻi’s first territorial forester. Hosmer’s Grove, Maui is one Hosmer’s forestry experimental using non-native species he planted in 1910. Unfortunately, some of the species are now invasive on Maui, such as the Mexican weeping pine, Monterey pine, and eucalyptus, displacing the native plants. The Hawaiian crow, or ʻalalā, (Corvus tropicus) fed on this hōʻawa, attracted by the bright orange inside color of the ripe fruit capsules and dark seeds and thus ensuring the spread of the plants. However, ʻalalā are now extremely rare and populations of hōʻawa in the birds former range are becoming very scarce as a result. This is a classic example of how interdependent native Hawaiian plants and animals are in the natural ecosystem. Sometimes this species is called the “Hawaiian magnolia” due to the tan fur underneath the leaves. The early Hawaiians used the wood to make gunwales for canoes. The outer layer of the fruit valves were used medicinally. They were pounded and used externally on sores. Once more commonly used on the mainland U.S. as an ornamental shrub, this hōʻawa is seen more in landscapes in Hawaiʻi nowadays.